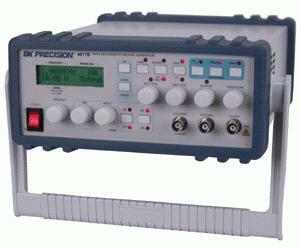 The B+K Precision Model 4017B DDS Sweep/Function Generator is a versatile signal source that combines several functions into one unit including waveform generator, pulse generation (through variable symmetry), frequency sweep and frequency counter. The heart of the function generator is a DDS based system that produces precision timing for sine, square, or triangle wave generation with frequencies between 0.01 Hz and 10 MHz. A continuously variable offset allows the output to be injected directly into circuits at the correct bias level. The versatility and capabilities of the 4017B allows for a vast number of applications in both analog and digital electronics fields including Design Engineering, Manufacturing, Servicing and Education. The 4017B has the ability to output a wide range of frequencies that encompasses sub-audible, audio, ultrasonic, and RF applications.